Nellie Tier natural skincare products are based on the age old practices of phytotherapy and aromatherapy to nourish. A hand blended range of luxury natural skincare products including face care, bodycare and bath products that focus on being safe, natural, fresh, sensuously luxurious, free from ingredients including parabens, SLS, mineral oils, artificial perfumes or colour additives. I have already reviewed a lot of Nellie Tier products. You can check the review of all of them here. Nellie Tier is my favorite “Made in New Zealand'” brand and there is not even a single product in this brand that ever failed on me. Under Eye care is often not taken care by most of us. With endless hours of browsing, Most of us have panda eyes. Even though, we apply under eye cream. That alone is not sufficient to take away those tiredness underneath your eye area. I love using refreshing gels under my eyes. It gives an instant cooling effect and it gives that extra boost before applying my regular eye cream. An eye gel is a must have skincare product and when I found out Nellie Tier has one, I was super excited to try it. Especially, the ingredients – green tea and cucumber drew my attention. I love the method of placing brewed tea bags underneath my eye area for 5-10 minute. Green tea bags reduce swelling and tighten the skin around the eyes. 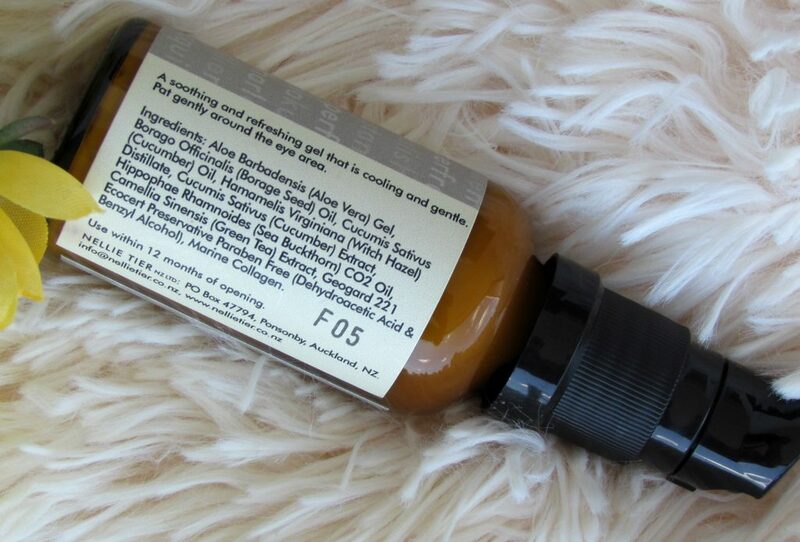 Reduce puffiness and relax tired eyes. The caffeine reduces puffiness by shrinking the blood vessels. Cucumber slices / placing cotton soaked in cucumber juice reduce the appearance of under eye darkness and puffiness – now, having said that- who on earth ahve time or these home remedies any which ways. 🙂 There comes to your rescue – this magic under eye gel from Nellie Tier – Nellie Tier Eye Gel is a soothing and refreshing gel that is cooling and gentle around your eyes. With nourishing Green Tea & soothing Cucumber. It’s for all skin types. Aloe Barbadensis (Aloe Vera) Gel, Borago Officinalis (Borage Seed) Oil, Cucumis Sativa (Cucumber) Oil, Hamamelis Virginiana (Witch Hazel) Distillate, Cucumis Sativa (Cucumber) Extract, Hippophae Rhamnoides (Sea Buckthorn) Oil, Camellia Sinensis (Green Tea) Extract, Geogard 221 (dehydroacetic acid & benzyl alcohol) (Ecocert Preservative Paraben Free), Marine Collagen, Lavandula Dentata (French Lavender) Essential Oil. I pat it gently around the eye area and give a nice massage and leave it for about 2 minutes after which I apply Nellie Tier Eye Cream. I use Nellie Tier Eye Cream at Night. For day I sue Nellie Tier Eye Gel + Clinique Pep Start. What I love about this is. It instantly give that cooling effect and you can just use it any time during the day/night and it just give that really nice cooling effect. If used regularly, in combination with the eye cream. It reduces the appearance of slight dark circles. Overall, If you are looking for a eye gel enriched with cucumbers & green tea that reduces under eye puffiness – this is the on, go for it; A bottle is going to easily last about 8-9 months if used regularly. It help reduce the appearance of fine lines. Instantly rejuvenates exhausted eyes. 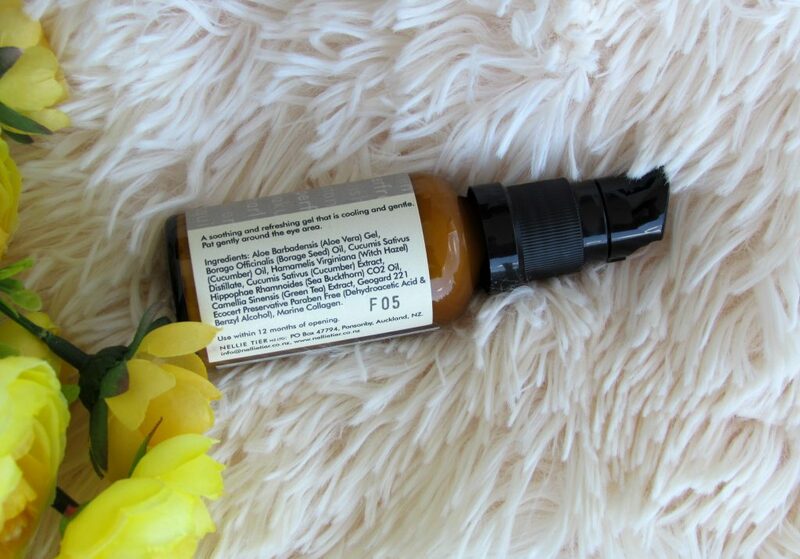 Use this after cleansing and apply to the eye area. I am sure to repurchase this. I use the entire Nellie Tier range and I am so in love with the entire range. Its soothing, refreshing and cooling. A must have from the brand. 1) During day time – apply Nellie tier under eye gel around the eye area. Massage it really gently. Once its fully absorbed, use the Clinique pep start eye cream and massage around the eye area. 2) For night time – apply Nellie tier under eye gel around the eye area. Massage it really gently. Once its fully absorbed, use the Nellie tier eye cream and massage around the eye area. 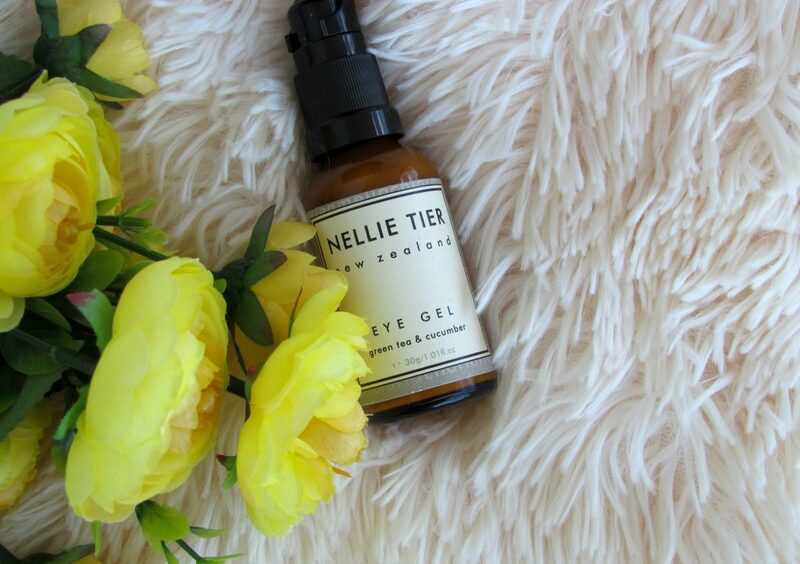 Have you used Nellie Tier Eye Gel. Which is your favorite under eye gel ? ** Product sent by brand. However, my review is honest and unbiased as always. Your dark circles are barely there. I have very deep dark circles.. I could definitely give this a try.